Find out why you should never skip out on your annual visit with your OBGYN. When it comes to health, we want to prevent problems from happening. One of the best ways to protect yourself is to get annual exams. Just as you should visit your GP for routine check-ups you should also visit Dr. Dori Kasparek, Dr. Supriya Rao, and our new physician, Dr. Akiva Gimpelevich, in Alpharetta, GA, once a year. If you are Russian or Spanish-speaking, the addition of Dr. Gimpelevich to the Complete Women's Healthcare staff means we can better help you, as he speaks the language, too. So, what makes these annual exams so important to your health? By coming in once a year you are taking an active step in preventing health problems from happening and being able to detect problems right away when they are often much easier to treat and less likely to lead to more serious complications. Like our other physicians, Dr. Gimpelevich has a lot of experience performing annual exams and can make sure your experience in our office is a stress-free one. He completed his residency in OBGYN at St. John’s Episcopal Hospital in Far Rockaway, NY, and can tell you these exams are important if you want to lead a healthy life. By coming in once a year we screen for breast, cervical, and ovarian cancers. Since cancer doesn’t often show symptoms right away sometimes the only way to discover cancer early on is through these exams. Furthermore, along with cancer screenings, these checkups can also detect infections, health problems, and even unexpected pregnancies. We know that it’s common for people to assume that health issues won’t happen to them, but even if you don’t have any risk factors you should still come in once a year. 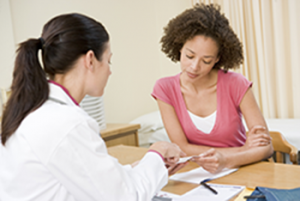 When should you start getting annual gynecological exams? Women should start coming in for annual exams once they have become sexually active or by the time they turn 21 years old (whichever occurs first). What is involved in these exams? During this visit, we will go through your medical history and determine if there are any risk factors or health problems that we should know about. From there, we will perform a breast and a pelvic exam. If you're over 21, a Pap smear may also be performed. A Pap smear allows us to collect cells from the cervix to check for early signs of cervical cancer. These visits are also a time for you to talk to us about any concerns or questions you might have about your health. No matter whether you want to talk about birth control options or want to get an STD screening, we can help. Here at Complete Women’s Healthcare, we believe that every woman should be able to get the gynecological and obstetric care they need in Alpharetta, GA. Whether you need to schedule an annual exam, just found out you’re pregnant, or want to talk to us about symptoms you are experiencing, don’t hesitate to call us. Should you have a gynecological issue that requires surgery, you can also rest easy. Dr. Gimpelevich specialized and completed a fellowship in Minimally Invasive Gynecological Surgery at Baylor College of Medicine in Houston, TX, so you can go through your procedure and start feeling better as easily as possible. We can help you no matter your problem.